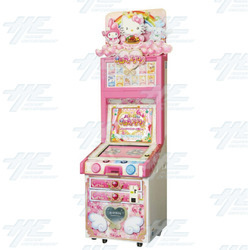 Hello Kitty and the Apron of Magic is a cooking-themed, card collecting children's arcade game manufactured by EXAMU and licensed by Sanrio. The goal of the game is to create tasty meals using ingredient cards dispensed by the upright arcade machine. Players decide on ingredients they think will taste good in a particular dish and then select these ingredients from the cards they have collected. Cards are sold seperately. Please contact us for card costs. There are three different types of cards to collect including red character cards, yellow ingredient cards and blue magic cards. Character Cards are the main cards of the game, in where represents the Sanrio character who will cook in the game. The player can only scan two of these in each gameplay. These are special cards which represents the food the player is about to cook. These are also important in the game. The player can only scan one of these cards. The Magic Power Cards were represented in blue and these add special magic to the dishes the player makes. The player can only scan one of these cards. The machine features dual LED monitors. There is a touch panel function on the lower screen. The upper screen displays the gameplay and results. There is a heat control dial for the game’s cooking stove – simulating a real cooking experience – and a help button to attract the attention of parents/operators for assistance. The game has a mode selection to increase or decrease the game’s difficulty. The game is aimed to appeal to younger children. The arcade game features Sanrio characters such as Kitty herself, Mimi and My Melody. The arcade version also introduces two new characters – Devi and Vivi.